In the midst of plunging temperatures, wearing pretty pastel shades helps me forget about the frost and is a fresh look after wearing deep jewel tones through fall. Want to give this trend a try? Wear the same hue from head to toe to appear leaner or experiment with colour blocking if pastels are your thing. If you're on the fence, start with accessories and work your way to that full length coat or pant suit. 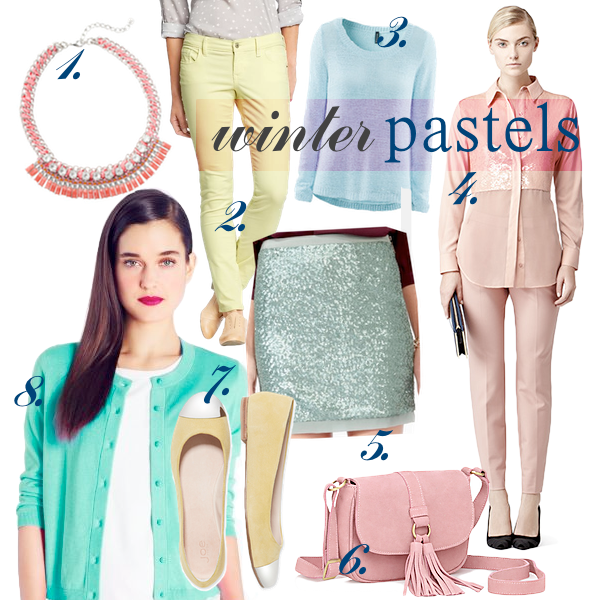 I'll mix my pastels with those jewel tone pieces that are already in my closet. Cotton Candy Pink worn with Garnet or Cobalt Blue with Mint, perhaps. Pastels will stick around for spring so you've got my permission to shop for a versatile piece that you can work into your wardrobe. 1. Short Ribbon & Chain Store Necklace, LOFT. 2. The Rockstar Pop-Coloured Cords in Margarita, Old Navy. 3. Crew neck sweater, H&M. 4. 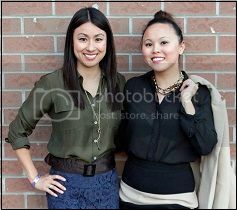 Daphne Contrast Fabric Shirt, Reiss. 5. Ditsy Sequin Skirt, Forever 21. 6. Mini Pastel Saddle Suede Bag, Simons. 7. Toe Cap Ballet Flat, Joe Fresh. 8. Sofia Cardigan, Kate Spade. Love, love, love this. Just snagged $20 mint coloured dress at Winners. Gotta figure out how to wear now!